UK retailer Marks & Spencer’s (M&S) Plan A – launched in 2007 by Executive Chairman, Sir Stuart Rose – is an ambitious 5-year plan which has become a benchmark for sustainable business in the UK, if not the world. M&S is the leading high street clothing brand in the UK. One of the great successes of the first phase of Plan A was in the Clothes/General Merchandise category. In the UK, approximately 500,000 tonnes or 1 billion items of clothing are sent to landfill each year; that’s 114,000 tonnes per hour. The strategy of Plan A was to encourage customers to recycle their waste garments by returning them to Oxfam, a national chain of charity/thrift stores in the UK. A £5.00 ($7.80, €6.20) M&S clothing voucher was the incentive. Over 10 million items of clothing were donated to Oxfam, raising about £8 million ($12.50 million, €10 million) for their projects around the world. Meanwhile, each voucher redeemed during this campaign part-subsidised an average basket value of £60 ($74, €94). At three times the average non-voucher-using shopper’s basket value, this was a revenue win for M&S. The original Plan A has moved into a new phase, energised by Sir Stuart’s successor, Marc Bolland, who observed that as consumers we are still “stuck in the American dream…(of) more, faster, luxury” and that Plan A needed to help build a new consumption model which works at scale. This means, for the clothing category, pushing a “bring something old, buy something new” culture. To this end, M&S set a new target “to help customers recycle over 20 million items of clothing a year by 2015,” including shoes, handbags, jewellery and bras. The first model-innovating step is branded “Shwopping.” This builds on the M&S and Oxfam Clothes exchange. It retains Oxfam’s capability as a re-seller and recycler of garments, but it also brings the collection in-house, via permanent, dedicated “Shwop Drops” in M&S stores. There is also an added social media element. The incentive has changed to a weekly prize draw of £100 ($160, €125) voucher and a Facebook-mediated league table of Shwoppers who gain Shwop points for shwopping visits and spreading the word. This kind of engagement approach, sometimes described as “gamification,” injects a competitive dynamic into an otherwise soft set of consumer messages. 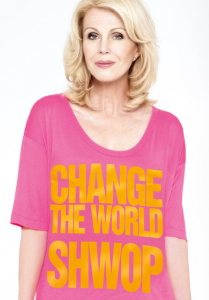 The campaign was launched by British TV personality Joanna Lumley. Joanna is an actress and style icon for the older generations, but she is also known by the younger M&S shoppers for her comic roles. Her fronting of the campaign blends humor with purpose, making a powerful idea accessible. The campaign included a heavy investment in TV. From the April 26 multimedia launch to mid-June, M&S had 750,000 Facebook users sign up to the league table, with the top 3 shwoppers returning an average of 4,000 items each. These clothing items will either be reused as raw material for new clothes, recycled into something different such as insulation, or re-worn by someone else, possibly someone in need in the developing world. Meanwhile, at the non-customer end of General Merchandise, Plan A is looking for innovative ways to improve on the first five years. Through the Shwopping campaign, M&S may also attract some new ideas to build on wins, such as cotton being grown with 50% less water, a staggering 80% drop in pesticide use, and other technical innovation in the fabric making, clothes manufacturing, and logistics. Show you are serious by setting quantitative targets, which you regularly report on. Once you’ve demonstrated progress, you have license to ask the consumer to engage in a deeper way. Use celebrity endorsement judiciously; the celebrity should complement the brand. Humor takes the edge off an otherwise “worthy” message. Gamification, using online B2C networks like Facebook, is becoming a popular method for increasingly “stickiness” of an activity, i.e. something which people return to frequently. If linked to quantitative targets it gives a sense of pace and progress, and an ability to celebrate good exemplars. Social media does not replace traditional media such as TV advertising, particularly if a proportion of your target consumers are not heavy internet users. An economic incentive, in kind, is helpful to drive engagement.